In a slow news week, this should’ve gotten bigger play. Fuel from the weed jatropha powered an Air New Zealand jet on a two-hour flight today–the world’s second flight of a commercial jet on biofuel. One out of the four Rolls Royce engines on an Air New Zealand Boeing 747-400 burned a 50-50 blend of regular jet fuel and a bio-version made from jatropha. The flight more than doubled the air time of the first biofuel flight–a 40 minute jaunt between London and Amsterdam in February. The plane climbed to an altitude of 35,000 feet and the engine performed normally, according to chief pilot Capt. David Morgan. Details are in Scientific American. Biofuels don’t contain the oil necessary to help seals and rings in engines swell. So the lief of an aircraft engine would be reduced. That’s a big deal. The GE engine on a 777 could go for as high as $10 million apiece. This issue is playing out in all forms of aviation, including general aviation. 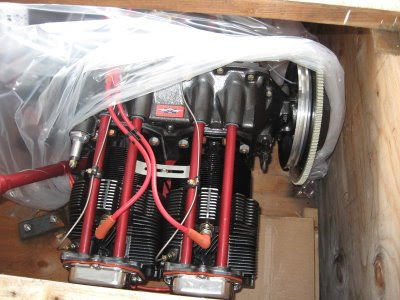 I have this thing sitting in a hangar — a new airplane engine. It runs on fully leaded gasoline, which is being phased out. It may be a huge paperweight in a short period of time. These engines can run on auto fuel, but Minnesota’s ethanol content will rot the seals and reduce its life. Researchers are trying to solve problems like this but so far there doesn’t appear to be a solution. Most of the small airplanes you see in the air are flying on borrowed time. If I’m not mistaken, both Virgin Airlines & US DOD have also flown on biofuel. Also, it seems the US lightplane fleet is as likely to run out of pilots as fuel sources. I haven’t paid attention lately, but can’t imagine the new student start rate is higher now than it was 10 years ago – when it was already at historic lows. Biofuels don’t contain the oil necessary to help seals and rings in engines swell. So the lief of an aircraft engine would be reduced. That’s a big deal. That is an impressive benefit, and one I didn’t realize. On the ground, transportation can theoretically be handled by a number of forms of energy – for a while coal was king. But it seems as though liquid fuels are the choice for aviation. If it’s not only possible but beneficial to use bio sources, well, perhaps we should focus on other ways to get around on land and save the relatively small supply of bio oil based fuel for airplanes. Regular visitors to the News Cut this topic knew this topic would catch the eye of both Bobs — Collins, the aviation fan, and Moffitt, the guy from the American Lung Association of Minnesota. Interesting information about jatropha oil (which has yet to be domesticated and grown commercially, as corn and soy are here) not containing the oil needed to lubricate seals and rings, because just the opposite is true of soy-based biodiesel in diesel vehicles. Our current B2 (two percent) biodiesel blend in Minnesota pumps actualy ADDS lubricity to the low sulfur diesel. In the New Year, we will be moving up to a B5 blend statewide.